Welcome to the PeaceMeal Project! Geoff Tansey will be in Toronto to present “Tinkering or Transformation: going beyond food and energy security for a well-fed world at peace” at the University of Toronto on Tuesday, April 16th. A key challenge this century is to create sustainable ways in which everyone can feed themselves well, in communities that peacefully cooperate with each other. If we humans carry on in the way we have let our leaders manage our affairs to date, then we are likely to see even greater conflict and loss of life this century than before – because of not despite our technological wizardry. How we meet everyone’s food needs will be a key factor in shaping the kind of world we have this century. It is part of a real security agenda I have been concerned with for decades. It goes back to the shocking sight for me, when I was working in Turkey in the early 1980s, of visiting a village where the people could run out of water for some time in the summer when their wells dried up. This in sight of a well-provisioned NATO installation, there as part of an early warning system. Far too much of human ingenuity, creativity, money, research and development activity focuses on better means of killing each other not supporting each other. After returning from Turkey in the mid-1980s I supported the World Development Movement in the late 1980s / early 1990s in looking at real security. This resulted in a couple of publications – a briefing, Disarm or develop and a paper Real Security – East, West, North and South – and campaigning activities. It also lead to the work with Paul Rogers, prof of Peace Studies at the University of Bradford, and the book A World Divided. 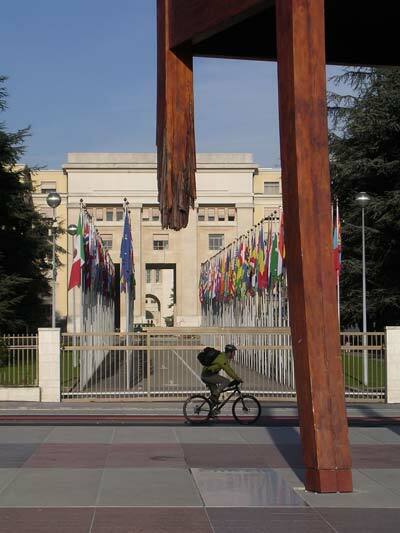 Giant chair with broken leg sculpture outside the United Nations in Geneva – a symbol of opposition to land mines and cluster bombs. These weapons have made farming very hazardous or impossible in many areas where conflicts have raged. The issues raised then about the need for a much broader understanding of what real human security means are still current. Indeed the Institute for Development Studies argues for using the notion of human security to develop a new post 2015 development framework in a paper – Human Security and the Next Generation of Comprehensive Human Development Goals – produced in May 2012 . How we produce and distribute food is a fundamental part of achieving real human security. It is clear that the current slogan arising from the plethora of reports on food and farming over the past few years – ‘Business as usual is not an option’ – applies far more widely. The challenges for future food provisioning and today’s inequities in hunger and malnutrition, overweight and obesity are symptomatic of a need for system change. How we approach creating fair, healthy and sustainable food systems is a key part of shifting the way the world works – and a lens to look through to show how to do so. Because for billions at present it doesn’t work. Geoff Tansey works for fair, healthy and sustainable food systems as an independent writer and consultant. He is a member and a trustee of The Food Ethics Council. His books include The Food System: a guide (with Tony Worsley) and co-editorship of The future control of food – A guide to international negotiations and rules on intellectual property, biodiversity and food security. In June 2005, he received one of six Joseph Rowntree Visionaries for a Just and Peaceful World Awards and, in 2008, he won the Derek Cooper Award for best food campaigner/educator, at the BBC Radio 4 Food and Farming Awards. He has degrees in soil science (Univ of Aberdeen) and history of and social studies of science (Sussex Univ) and also studied at Case Western Reserve University on a Rotary Foundation Graduate Fellowship. He helped found and edit the journal Food Policy in the mid-1970s, has worked on various agricultural development projects in Turkey, Mongolia, Albania and Kazakstan and travelled widely. He was honorary visiting professor of food policy at Leeds Metropolitan University from 1996-99 and is now an honorary research fellow in the Department of Peace Studies at Bradford University and honorary visiting fellow at the Centre for Rural Economy at the Newcastle University. This entry was posted in Political Peace, Republished, Social Peace and tagged arms, business as usual, conflict, food, food distribution, NATO, peace studies, security, sustainability by hannahrenglich. Bookmark the permalink.